A Lesson in Mustard Seed | Oh, for the Love of Vintage! Hi lovelies and happy Saturday! I know it’s been a while since my last post; my apologies! Now that I’m back, it’s time for a lesson in mustard seed, a genre of vintage jewellery I collect and adore. Yes, you heard me correctly – I did say mustard seed! Mustard seed is the seed from the mustard plant from which the condiment is made. Mustard seeds are light or dark yellow, tiny and oval in shape. The mustard seed is referred to in the Bible as a symbol of faith and hope. There is even a parable devoted to the mustard seed, and if you’re interested you can read about it here. Due to the mustard seed’s symbolic meaning, it was used widely in jewellery starting around the Victorian period. In Victorian mustard seed jewellery, the mustard seed is encapsulated in glass, creating an amulet. During this period, both men and women wore mustard seed jewellery. Women wore mustard seed necklaces, brooches, bracelets and charms. 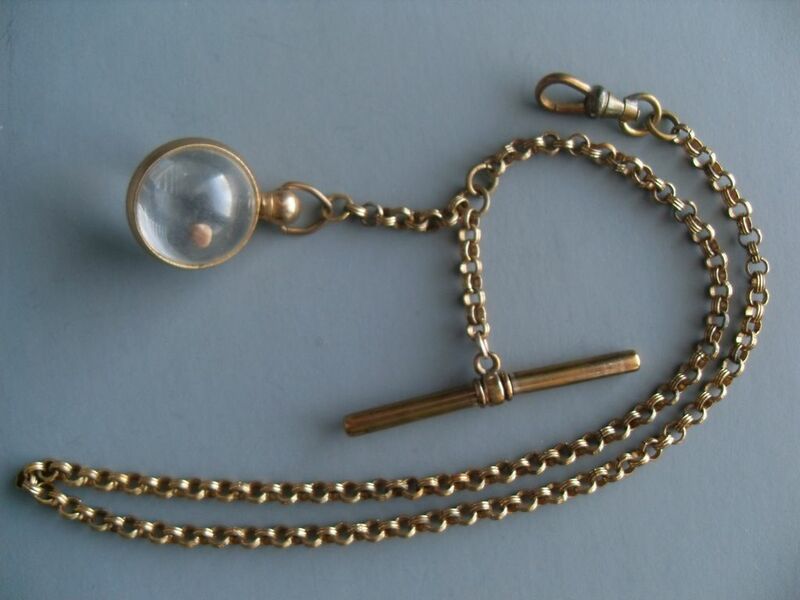 For men, it was more common to wear a mustard seed amulet on a watch chain, a tie tac or as cuff links. In the 1940s and 50s, mustard seed jewellery was again popular, with several major companies manufacturing pieces. At this time, the seed took on a more general and less religious meaning, that of good luck. The glass that was previously used in mustard seed pieces was replaced with the widely used plastic, Lucite. Like in the Victorian period, the mustard seed was encapsulated creating a type of amulet, either round or heart shaped. 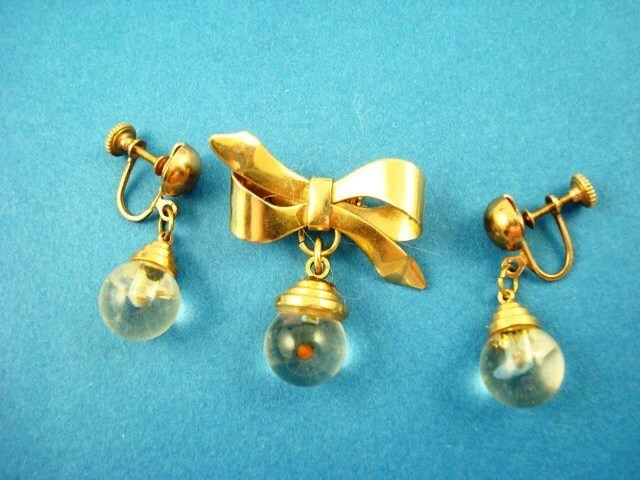 Let’s have a look at more vintage mustard seed jewellery! 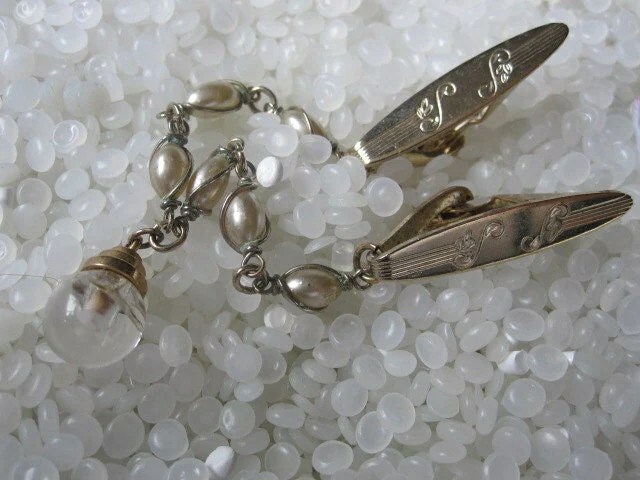 Vintage mustard seed jewellery is highly collectible and the prices often reflect that. However, you can find inexpensive vintage pieces at yard sales, flea markets and online at Ebay and Etsy. Do you have any mustard seed jewellery? Let me know! I adore discovering new types of vintage jewelry that I’ve not yet encountered, and these captivatingly special mustard seeds are precisely that. There’s such a sweet, lovely sentiment behind them, and I now very much feel like I want a mustard seed brooch of my own. Yourself and some other readers had never heard of this type of jewellery and I’m so glad to have brought it to attention. I hope you find a special piece. I saw a few on ebay and etsy. ;0 Do let me know when you get one, I’d love to see it! This is so interesting! We deal in a lot of vintage jewelry over here, and I’ve never even heard of mustard seed jewelry! Thanks for the extremely helpful lesson – I’m going to be on the lookout now! Pingback: A Lesson in Vintage Jewellery Care & Storage « Oh, for the Love of Vintage! I gave my gift as a 12 years old girl (I’m 72 years now) to a granddaughter just yesterday for HER 12th birthday. I found one that is exactly like one you have above (Germany). This is why I Googled and found your blog. But how’s this for a bit of luck – you also had a photo of an item that I have been trying to figure out what in the world it is! I was about to post a picture of a sweater guard on FB and ask if anyone knew what it was. So, thanks to my lucky mustard seed, I now have that figured out! I will be looking for this type of jewelry and will contact you if I find anything good. Thanks for taking the time to write this out for the rest of us! Hi everyone, I’m glad you find this post useful! Squirrel, I’m unsure the bracelet is signed, but I will check. My sister in law gave me an entire jewelry box full of 70’s & 80’s costume jewelry to sell online. She was a Buyer for the Limited so I found some pieces that brought back memories and one awesome Christian Dior piece. I would love to just buy and sell vintage costume jewelry 24/7. Maybe someday! Start with something like the Poshmark app. Well since I tore my mcl on the last day and the last hour of ski season I am trying to find things to do at home with this disability…..so I have been digging in boxes of goodies from a long time ago and found my mustard seed bracelet that I got when I was around the age of 10, 50 years ago….I just remember everyone had to have one and I got it for my birthday….I only remember it being good luck, which is why I am wearing it right now…..and like you said HOPE….which is something else I could use right now…will let you know if it works…. Hello to all I was intrigued by the meaning of these mustard seed (coro)earrings & pendants….so eye catching& lovable! My daughters and I can’t keep all these wonderful treasures, I hope to find good homes for the majority of my vintage jewelry and keep those(of our likes) to dazzle the world with, while the other peices(great but not our choice peices)can be enjoyed by those who would really appreciate and show off.so many and only 7 days in a week! any ideas where to start &show to price?please email me for pics. (im new to this Market area)thanx.much love. I just found a mustard seed bracelet in a box of jewelry my dad gave me. It’s the only piece with engraving and so I decided to look up what the history was on it. I’ve never seen a mustard seed piece before! I love the concept and the vintage pieces here are much cooler. I’d love be able to find out how I can better identify the specific piece I have. Lmk if you have any tips for that! Thanks! HI, I had the idea to display my brooches in a shadow box. I have a mustard seed brooch glass and silver colour as yours, and its stamped coro. whould it be from the 40s or 50s era…is it of any value ? I have a charm attached to my grandmothers watch!! She was born in 1901. She was my pride and joy! Brings so many childhood memories back when I was a child! Fiddling with her charm! She has always lived a life of “faith and hope” which she passed on to me! 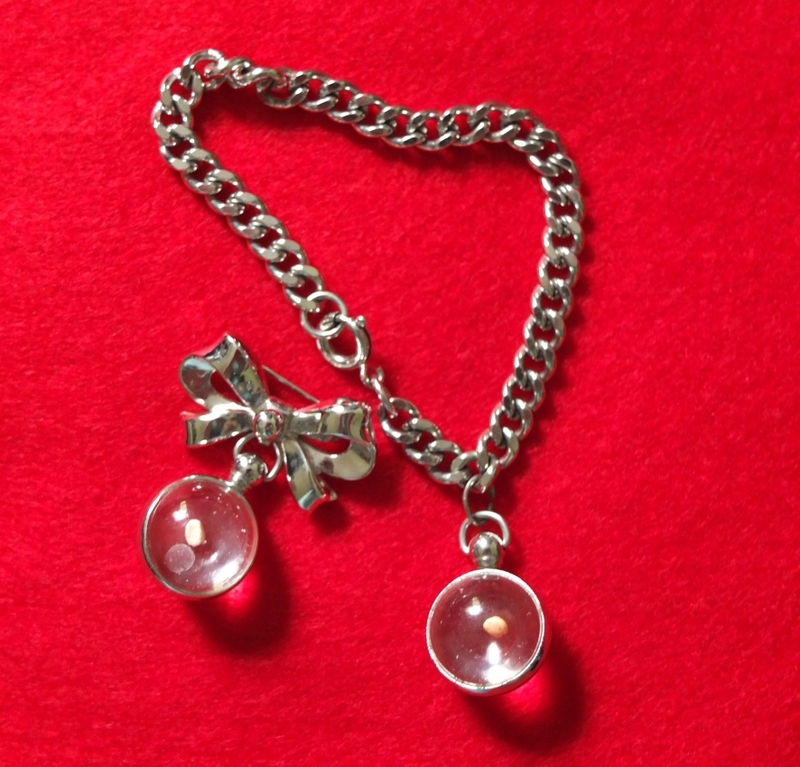 This mustard seed charm is priceless!! Yes, Black Dahlia … I have my Mother’s Mustard Seed jewellery that she had and wore in the early 1950’s. ( heart shaped bauble & imitation pearl necklace with ear rings and broach also ) Have often wondered if it has any value other than MY personal love for it . I have a necklace and matching bracelet with mustard seed charms. It was given to me as a child. I’m 56 so I’m not sure if it was older or was bought in the sixties. Funny thing. I just went through a lot of my childhood jewelry and gave most of it to Goodwill. Most of them are pieces for young girls so it’s appropriate. But I did keep a gold heart charm necklace and the matching mustard seed pieces because they are vintage. My 92 year old grandma gave me a necklace. Small round glass ball with a dark mustard seed. Beautiful and very old. Any idea the worth. Glass is in perfect condition. I don’t have jewelry but I just obtained a domed lucite plate with red mustard seeds embedded in the bottom half and a single seed embedded in the top knob. I know nothing of this piece.